Cloud Communications Tailored to Your Needs. 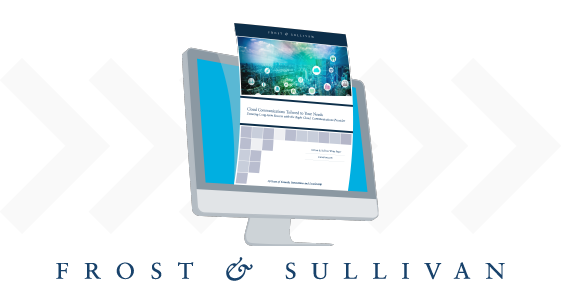 A Frost & Sullivan white paper. Rapid technology evolution and economic globalization are intensifying competition. Businesses must find operational efficiencies and innovative ways to create customer value. Frost & Sullivan research finds that many companies worldwide are embarking on digital transformation projects aimed to enhance employee productivity and improve customer engagement. Forward-thinking organizations are leveraging advanced technologies such as Internet protocol (IP) telephony, unified communications and collaboration (UCC), cloud, fixed-mobile convergence (FMC), Big Data, and the Internet of Things (IoT) to gain a com petitive advantage. Cloud communications services significantly reduce upfront equipment, software and implementation costs, which greatly appeals to budget-conscious businesses. Frost & Sullivan research reveals that 68% of businesses are moving to cloud-based communications to more quickly and cost-effectively access advanced capabilities. Unlike most on-premises UCC platforms that require redundant hardware and software configured in a simple active/passive model to ensure business continuity. Something sales related I can help with? If you have tried reaching out to us after hours, please check out our award winning Partner Site for more information on joining our team! available Mon-Fri. 8:00 - 5:00 MST. Our chat team is available Monday through Friday, 8:30 am to 5 pm MDT. If you have reached us after hours, please reach out to us at quoterequests@jive.com or call us at (385) 440-0777 and we will get back to you as soon as possible. Thank you!